In this chapter we give examples of 6 rehabilitation programs in 5 countries. Each is quite different, yet all are similar in that they are largely or completely run by disabled persons themselves, or by their families. Although they all work closely with the local community, each has a small 'center' of some kind where disabled persons or their families can help meet each other's needs. We do not claim that the examples given here are the most outstanding or successful programs. Rather, they are the ones with which we are personally most familiar. Our description of each program must be brief. We will, therefore, try to focus on their most interesting and original features, especially those that could serve as examples for other programs. Also, we describe how these have grown and spread to new communities. This kind of grassroots seeding from community to community, although slower and less orderly, may be more effective than is 'planting' of pre-designed programs from on top. Project PROJIMO is a rural rehabilitation program in western Mexico, run by disabled villagers, to serve disabled children and their families. 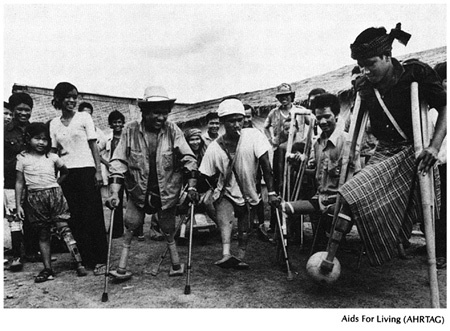 It was started in 1982 by disabled village health workers from an older community-based health program (Project Piaxtla). PROJIMO's goal is to help disabled children and their families become more self-reliant. It aims to provide low-cost, high-quality services to poor families who cannot obtain or afford services elsewhere. 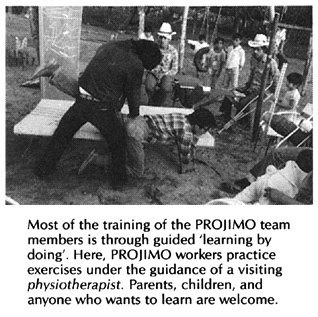 The PROJIMO team provides a wide range of rehabilitation activities and equipment. These include: family counseling and training, therapy, work and skills training, brace making, artificial limbs, wheelchair making, special seating, and therapeutic aids. PROJIMO is based in one small village but serves children and their families from neighboring towns and villages, and even from the closest cities (over 100 miles away). Local villagers cooperate by taking visiting disabled children and their families into their homes. Schoolchildren help make the playground- for-all-children and toys for disabled children. Community control. Unlike many 'community-based' programs, which are designed and run by outsiders, PROJIMO is run and controlled by local disabled villagers. De-professionalization. The village team, although they have mastered many 'professional' skills, is made up of disabled persons with an average education of only 3 years of primary school. Their training has been mostly of the non-formal, learn-by- doing type. There are no titled professionals on the PROJIMO staff. However, therapists, brace makers, limb makers, and other rehabilitation professionals are invited for short visits to teach rather than to practice their skills. The PROJIMO team believes that only by simplifying rehabilitation knowledge and skills to make them widely available in the community, can the millions of unserved disabled children in the world receive the basic assistance they need. Equality between service providers and receivers. When asked how many 'workers' they have, the PROJIMO team has no easy answer. This is because there is no clear line between those who provide services and those who receive them. Visiting disabled young persons and their families are invited to help in whatever way they can. 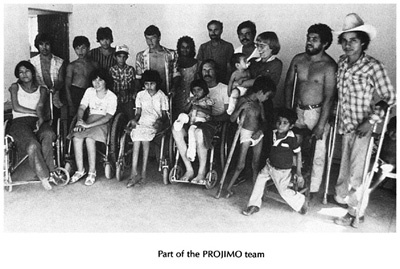 Most of the PROJIMO workers first came for rehabilitation themselves. They began to help in different ways, decided to stay, and gradually became team members. Modest earnings. The PROJIMO team believes that they should work for the same low pay as that of the farming and laboring families they serve. They can see that the high pay demanded by professionals and technicians is one reason that the children of the poor often cannot get the therapy and aids they need. Unity with all who are marginalized. The PROJIMO team sees society's unfair attitudes toward the disabled as only one aspect of an unjust social structure. They feel that disabled persons should join in solidarity with all who are rejected, misjudged, exploited, or not treated as equals. This feeling has led the team to become more self-critical and to seek greater equality for women within their own group. 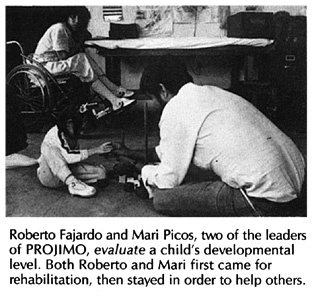 Thus the PROJIMO team views its role not only as one of helping disabled children and their families gain power, but as part of the larger struggle for social change and liberation of all who are 'on the bottom'. Grassroots multiplying effect. The PROJIMO approach has been spreading in various ways. Locally, families of disabled children in a number of towns and villages have begun to organize, build playgrounds, and form their own special education programs, as more or less 'satellites' of PROJIMO. PROJIMO has also invited visitors from rehabilitation and community health programs in other parts of Mexico and Latin America to visit and take ideas back with them. Some programs have sent disabled representatives to work and learn at PROJIMO for several months so they can start similar programs in their own area. The PROJIMO experience has been the basis for writing this book. Different examples or descriptions from PROJIMO are discussed in various chapters. For further references, see the Index. 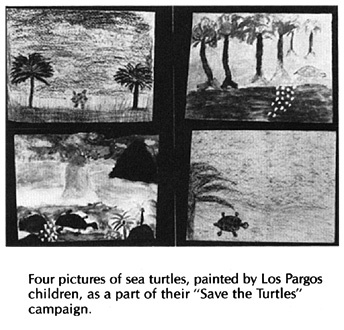 A 64-page report on PROJIMO with many illustrations is available from The Hesperian Foundation (see Page 637). 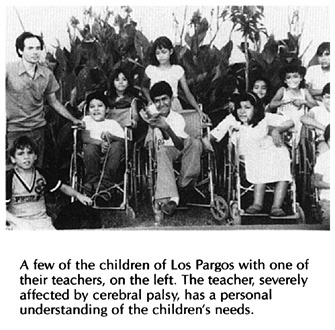 Los Pargos is an organization of families of disabled children in Mazatlán, a city on the west coast of Mexico. The program was started privately by Teresa Páez, a local social worker. 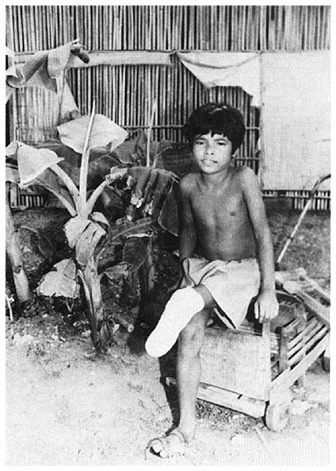 While she was working in a public hospital, Teresa became concerned that although disabled children were given basic medical treatment, they received almost no rehabilitation. Most did not go to school because of non-acceptance by teachers, difficulties in transportation, or overprotection by parents. Teresa began by bringing a group of concerned parents together, and they invited others. Today Los Pargos includes about 60 families with disabled children, and it continues to grow. Los Pargos has set up its own special education program and has convinced the local university authorities to make space available in a local prep school after school hours. Some of the teachers, who are volunteers, are also disabled. This makes them good role models for the children. The word 'Pargos' is the name of a large, colorful fish! The children picked the name. It is perhaps appropriate, since much of the money for running the program and transporting the children comes from fish scales! On weekends the children and their parents visit the beach where fishermen dock their small boats and clean their fish for the market. The group collects the large fish scales, which they clean, bleach, color, and use to make artificial flowers. The children and parents set the flowers in attractive bouquets and designs together with small seashells, seaweed, and other dried sea life. In the tourist city of Mazatlán, selling the flowers has become a good business. When we last visited Los Pargos, parents and children were working very hard to fill a rush order for 2000 bouquets! 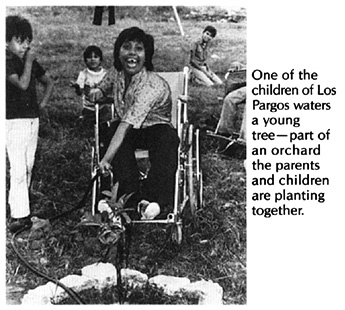 Los Pargos, located about 100 miles from PROJIMO, often takes groups of 'parguitos' (disabled children) to PROJIMO for rehabilitation services that they have trouble getting in the city. Also, their visit to PROJIMO is an adventure into the country for these city children and their parents. One of the goals of Los Pargos is to convince the government, the public schools, and society in general to accept, respect, provide opportunities, and help meet the needs of disabled children. Some things are changing, but slowly. As one of the parents explains, "The best way to get something done is to do it ourselves!" The idea of Los Pargos has begun to spread to other communities. Families of disabled children in Culiacán, the next biggest city to the north, are trying to organize a similar program. The key to success seems to be a few persons with energy, commitment, and an ability to get people working together. 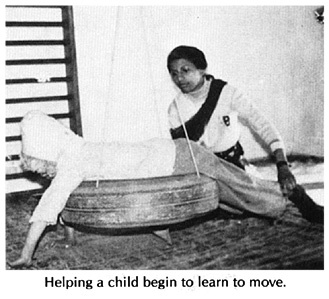 Located in the capital Dhaka, CRP is run by a local team, with the help of a British physiotherapist. Four of the staff members have spinal injuries themselves. The CRP provides short -and long-term 'participatory rehabilitation' to severely paralyzed persons. 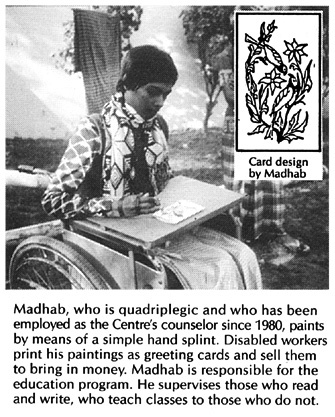 Almost from the day of arrival, newly paralyzed persons begin to do jobs to help the Centre bring in some income. Those who must lie on stretcher trolleys (wheeled cots) work on jobs ranging from making paper bags to be sold in the local marketplace, to welding and painting of orthopedic equipment. The group produces orthopedic and hospital equipment, not only for those it serves directly, but also for sale in hospitals and in the community. CRP teaches practical skills through 'learning by doing'. The work that participants do not only brings in money for the program, but also teaches them ways to earn money after they return home. Skills learned are mostly those that will let persons have their own small home business-a roadside stand, sewing and tailoring, weaving, welding, and metalwork. CRP has developed a wide range of low-cost orthopedic and rehabilitation equipment adapted to the needs and lifestyle of local villagers. 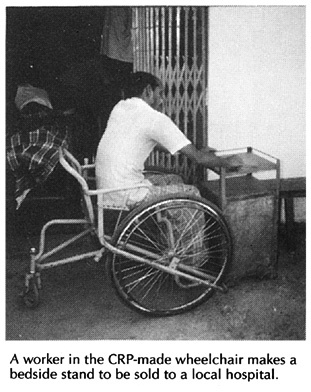 Examples are ground level wheelchairs, or 'trolleys', for those who cook and eat on the floor (see Page 590), and simple metal frame beds that can be easily lowered to near ground level for easy transfer into the low trolleys (see Page 572). The Centre for the Rehabilitation of the Paralysed is financed mainly from outside grants and partly from the sale of its products. For more information on this center and its equipment, see Page199, 483, and 509. 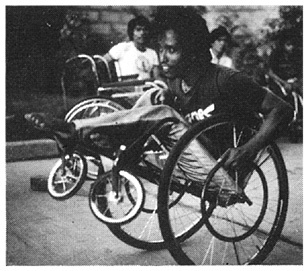 The Organization of Disabled Revolutionaries (ORD) was started after Nicaragua's liberation from the Somoza dictatorship, by a group of young persons who had become paralyzed by spinal cord injuries. Some had been boys of 13, 14, or 15 years old when they first joined the struggle against Somoza. 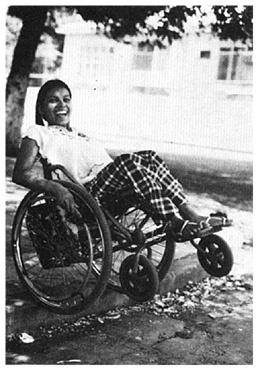 ORD was begun because of concern for a common need: wheelchairs. With the increase in disabled persons from the war, the lack of a local wheelchair factory, and the difficulties of importing wheelchairs due to the United States' embargo, the shortage was severe. Two young North Americans who both have spinal cord injuries, one a peer counselor for the disabled and the other a wheelchair designer and engineer, helped ORD organize and set up a small wheelchair factory. 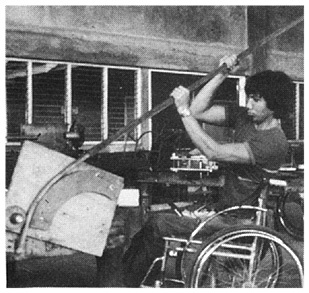 The ORD team of disabled workers now produces its own high-quality metal tubing wheelchairs, adapted for rough ground (see Page 622) at a cost far lower than standard commercial wheelchairs. Although ORD started with wheelchairs, it has grown to become a group that represents and stands up for the rights of all disabled people. It has pressured the Health Ministry to respond more to the disabled and their needs. The government - which, much more than most governments, tries to represent the people - has responded well. It has allowed ORD 'time' for short educational programs on public radio and television. And it has agreed to help pay the cost of wheelchairs made by ORD for families too poor to pay. ORD is in close communication with the head of rehabilitation for the nation. In this way, the disabled organization has some voice in national policy making. These are some of the advantages experienced by a community-directed program in a country with a revolutionary popular government. On the other hand, ORD suffers from the embargo and other difficulties imposed by the United States government. At times, the wheelchair production almost stops for lack of metal tubing, bearings, and other basic materials. ORD is having an increasingly far-reaching influence. It has begun to help organize groups of disabled persons in other parts of Nicaragua. Also, members have helped conduct training workshops in Central American and Caribbean countries to teach representatives from other disabled groups how to make wheelchairs. The program began in Peshawar in the Northwest Frontier Province of Pakistan as a small play group for 8 mentally handicapped children. In 1978 the 3 Pakistani staff were joined by a Welsh special education teacher and her husband. During the next 7 years the play group grew to become a community rehabilitation and resource center with daily participation of 70 physically and 40 mentally and multiply disabled children. Local staff persons are trained by the few professionals in special education, physical therapy, brace making, parent counseling, and planning services. An important part of the program is the Community Rehabilitation Development Project. The big, largely rural area surrounding Peshawar is very underserved. 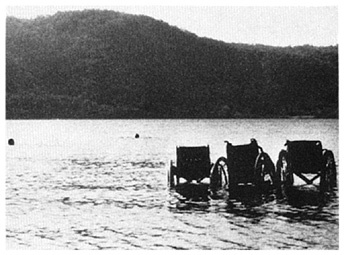 To accomplish as much as possible with limited resources, disabled children in towns were considered first. Volunteer college students went door-to-door to find and bring together parents and relatives of disabled children. Public meetings were held and an Association was formed in each town with the aim of starting rehabilitation activities. 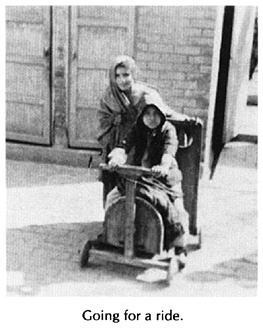 People (sometimes young disabled persons) were chosen and sent to learn basic skills at the Peshawar center. Meanwhile, the Association committee raised funds and found a place that could serve as a modest rehabilitation center. Although the parent program has had UNICEF and other outside funding, the neighborhood rehabilitation centers have mostly been funded locally, some with a government subsidy. Management is entirely in the hands of local people. In addition to providing daily special education and physical therapy, the neighborhood centers act as a resource within their districts. They distribute advice, pamphlets, and books to families for home rehabilitation. Where possible, going to normal schools is encouraged. 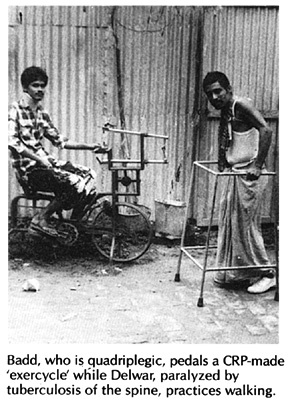 Mike Miles, Christine's husband, has also written many excellent and critical papers on rehabilitation efforts -and problems- in developing countries (see Page 641). The Peshawar program has succeeded in promoting community-directed rehabilitation activities in much of the Northwest Frontier through organizing an already motivated group (parents of disabled children). One of their keys to success is to: "Do the easy thing first!" 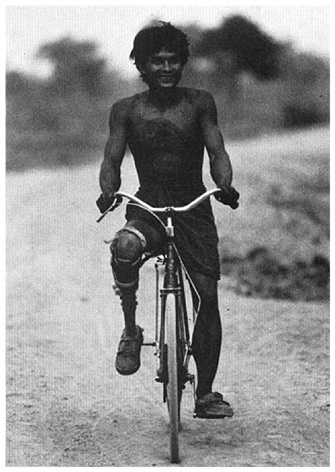 It is estimated that in the last 8 years of the war in Kampuchea (Cambodia) more than 12,000 men, women, and children have lost their legs from stepping on land mines. A lot of the injured are evacuated for hospital care to a large refugee camp, called Khao-i-dang, close to the Thai border. 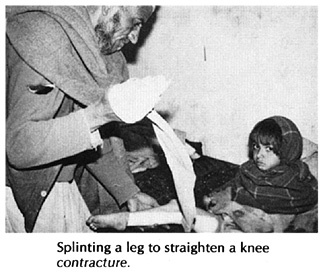 At first the hospital had no way of making or obtaining artificial limbs. 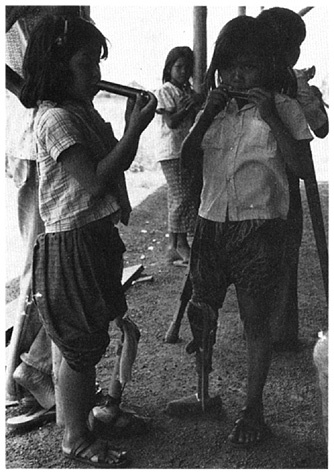 For this reason a French relief agency (at that time SOS, or Enfants Sans Frontiéres, now Operation Handicap Internationale) began making low-cost artificial legs. The workers in the large workshop are almost all refugee amputees. Some start learning by helping to make their own leg. The team (run by Frenchmen, some of whom are professional limb makers) has developed different models of very low-cost limbs using local materials. The bamboo limb described on Page 628 is one example. One of the most outstanding features of the program is the way it has spread to other areas. 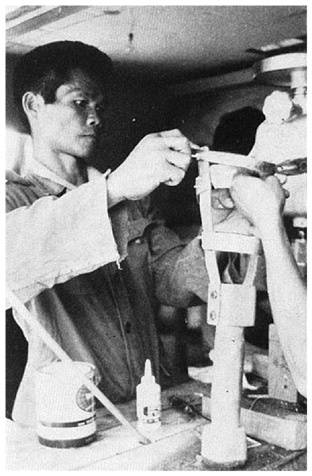 Many of the amputee workers trained in Khao-i-dang have gone back into Kampuchea and opened small artificial limb shops. The program therefore trains the amputees not only in the technology of limb making, but also in basic management. Some of the 15 'satellite shops' now have teams of several amputees working in them. The most remote shops are run in make-shift shelters deep in the forest near the fighting. The spirit of hard work and friendship in shops run by amputees does much to help recent amputees accept the loss of their limbs and get back into the adventure of survival.